I hardly ever draw with anything but my Wacom tablet, and when I do it's almost always just a doodle while I'm on the phone or whatnot. Someone asked for a sample of that the other day, so here you go -- I drew this while talking with a realtor about an upcoming move. It's actually drawn with a ball-point pen on a piece of note paper because that's what's by the phone. I can see this as one of many mechanical henchman (henchbots?). 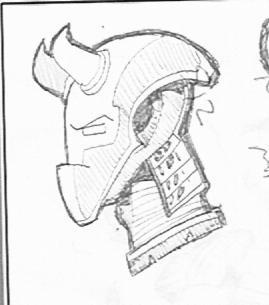 It’s a cybernetic HellBoy from the future. And here I thought it was the Grumpbot Mark I, from Ronco!